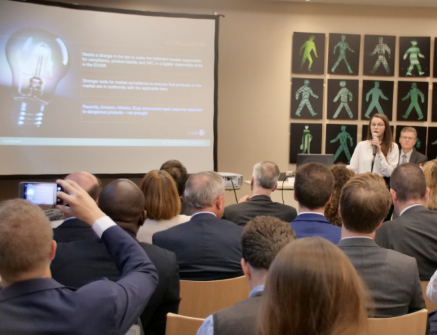 A workshop hosted by Eucolight, the European association for lighting WEEE compliance schemes, gathered over 100 experts last month to discuss online sales of non-compliant products. The workshop concluded that solutions must be implemented to make online marketplaces responsible for products sold through their portals. The workshop, held in Brussels on October 17, discussed the widespread availability of products through online marketplaces that do not comply with consumer safety standards, VAT requirements, and environmental obligations. High level speakers discussed who should be legally responsible for the non-conformity of products, and how this can be introduced into European and national legislation. Leva Vardanyan, market compliance manager of the Lighting Industry Association (LIA), reported on a retail mystery shopper testing study. The initial findings of the survey revealed that a high proportion of lighting products sold through online marketplaces have serious electrical safety risks. According to Vardanyan, just removing the individual products detected from the market cannot be the solution – changes in the law and stronger tools for market surveillance are needed. Richard Allen, lobbyist from Retailers Against VAT Abuse Schemes (RAVAS), described the large scale of VAT avoidance through online platforms. He argued that marketplaces have a great responsibility here. Through amendments to VAT legislation, the EU and and some Member States are supporting this approach and making marketplaces responsible. Germany, where there are new VAT obligations for online marketplaces if the seller is not compliant, is a good example. Nigel Harvey, chief executive of Recolight, described a study undertaken by the WEEE Scheme Forum, to check the WEEE compliance of products sold through online marketplaces. This showed that 54% of power tools, 76% of LED lightbulbs, and 88% of fitness watches did not comply.